The Congress today condemned Pakistan for harassing Kulbhushan Jadhav's mother and wife, and said it was an "insult" to all Indians. NEW DELHI: The Congress today condemned Pakistan for harassing Kulbhushan Jadhav's mother and wife, and said it was an "insult" to all Indians. The opposition party said the matter was "important" enough to put an end to the impasse in the Rajya Sabha. "We, as Indians, protest this strongly and condemn strongly this act of Pakistani government and we would like to discuss, show our displeasure tomorrow on the floor of the House. 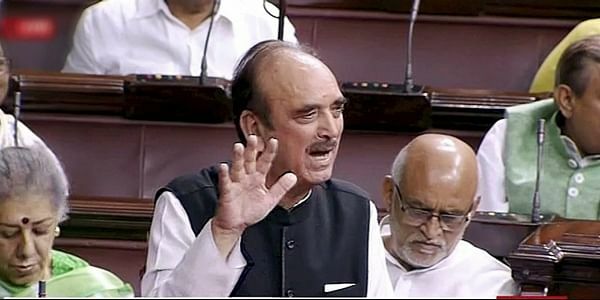 This was the single most important case, we did not want to continue the impasse," Leader of the Opposition in the Rajya Sabha Ghulam Nabi Azad told reporters outside Parliament. The Rajya Sabha has not functioned normally since the start of the winter session on December 15, due to disruptions by the opposition over Prime Minister Narendra Modi's remarks against his predecessor Manmohan Singh. He condemned Pakistan's action of forcing Jadhav's mother and wife change their clothes and remove "bindi" and "mangal sutra", besides shoes. "This is not just an insult to the mother and wife of Kulbhushan Jadhav but also an insult of India. This is an insult to 1.3 billion Indian people irrespective of religion and caste," he said. Azad said the way Jadhav's wife and mother were harassed and treated by the Pakistani government, it is something which "simply we should not tolerate as Indians". "We may be in the opposition but we are Indian first... Kulbhushan Jadhav is our fellow citizen. We will cooperate with the government...we would expect that he should get justice," Azad said. The Congress leader said Pakistan had to succumb to international pressure to allow Jadhav's family members to meet him, but "we did not expect that his family members Â– mother and wife Â– will be separated by glass wall". "We could never think of that they will not allow to meet, hug and talk to each other face to face. They were allowed to talk through intercom. What is difference between intercom and telephone? His family members were watching him over television for the last so many years," he said. The Congress today ended the week-long impasse over Modi's "conspiracy with Pakistan" remarks against Singh made during the Gujarat poll campaign. Asked whether this was a climbdown or succumbing to any pressure, he said, "There is no question of succumbing under pressure and we shall never compromise with our commitment. Our commitment is most important for us, commitment to the country, the people are very important to us." Azad said, "We did not want to continue this logjam for longer period. We have come to the conclusion that the government was feeling happier with this impasse in Parliament." "We decided that we should not confine ourselves to one issue and hammer in time and again for days and weeks together. That means to let up the government from these issues which come up every day. I think we could smell that the government and the ministers particularly those facing the question hour were very happy," he said. He said talks were on with the government to end the stalemate and that a committee had been formed by the Rajya Sabha chairman and both the sides concluded that other issues needed to be taken up in the Upper House.